Breast Cancer Solutions Foundation raises funds through a joint project with Anaheim Thrift. 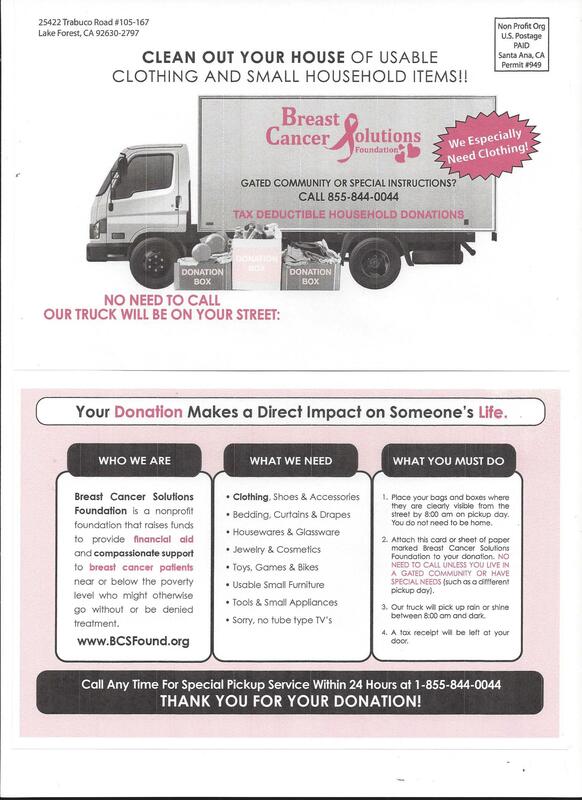 Your donated goods help raise funds for Breast Cancer Solutions, whose mission is to provide breast cancer patients with direct assistance, community referrals and compassionate support. Please call 855-844-0044 if your items were not picked up on your scheduled day, if you live in a gated community, or to arrange a special pick up. If you did not receive your receipt, please email foundation@breastcancersolutions.org or call 866-960-9222 ext. 4.